It's a fact: We all love pancakes. But unfortunately they are just not very good for us. Eating a true pancake once in awhile is a nice indulgence but if, like me, you are trying to eat more healthy meals made of more whole foods, pancakes just aren't going to cut it. 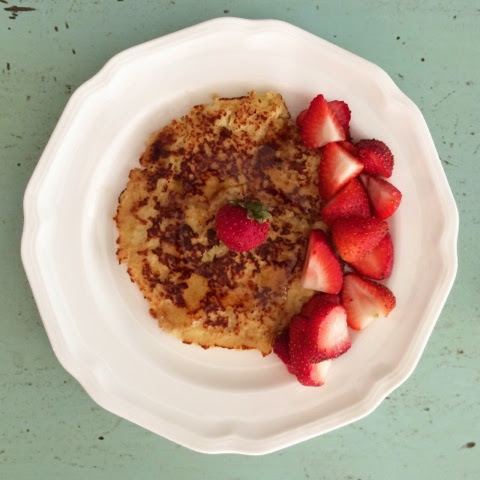 The good news is, there are different ways to make a pancake healthier, flour less and gluten-free. This recipe is actually packed with nutrients also. So happy flap-jacking...recipe is below! Mix all the ingredients together. Cook as you would a regular pancake, on low-medium heat. Allow one side to solidify before flipping and cooking the other side (about a minute per side). Serve with berries or other fruit. This recipe will yield 3 small pancakes. Double the recipe to cook for a larger family.